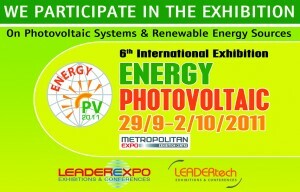 We participate in the 6th International Exhibition ENERGY-PHOTOVOLTAIC Systematic Photovoltaic & Renewable Energy, which will be held from September 29 to October 2 2011.Sto new Exhibition Centre METROPOLITAN Expo (Athens Airport). We are waiting to meet us. Visit us at our stand Hall 3, booth 3Α 152 Α.